One of the closely-held secrets of life on Whidbey Island is that the summers are generally quite wonderful. Meteorology Professor Cliff Mass at the University of Washington says that July 9 is the true beginning of the season here, and my own observations tend to agree. What that means is that visitors swarm here during July and August, when the chance of rain is astonishingly low and the likelihood of sunshine on any given day is close to 100%. (We try never to share this information.) Tourists, families, friends, relatives, curious explorers — we see roughly double the normal population through the weeks of these two months. Historically, there has been little of that impinging on my own life, but this year has so far been an exception to that pattern. The past few weeks have been quite the mad social whirl — sister and niece for several days, then a short respite, friends from Florida for a few days, another short respite, and friends from British Columbia this past week. And while none of them have stayed with me, still the process of juggling visiting and normal daily life has slashed away at loom time. Nonetheless, there’s been sporadic action on the weaving front, with something to show for it. This run of ten designer towels is named “Good Vibrations”, for reasons which may or may not be apparent. It began as a discussion last fall with Kathrin Weber (Blazing Shuttles dyer) about weaving her a towel that would echo the colors in her North Carolina kitchen. Eventually, she dyed her signature ringspun cotton in those colors and sent two 200-thread warps off to me. I was not enthusiastic about the colors, so the yarn sat for many weeks in a spot where I had to see it many times a day while I mulled over how I wanted to proceed. Eventually the light dawned. For accent, I added in a thick/thin mercerized cotton in a clear burgundy which is close to the color of Kathrin’s new wood stove, and at that point things finally became interesting. During the weeks when I was dithering, I designed a series of patterns to be used in this run of ten towels. I call them Dancing Mountains, which actually refers to the threading sequence for the warp (lengthwise) threads. The “line” in the draft (pattern) on the computer is similar to the jagged silhouette of a mountain range; the other half of the sequence simply turns the line upside down. This gave me some interesting possibilities for patterns in the cloth which would “reflect” each other in reverse. Hard to see in my photographs, since most of the weft (sideways) yarns I’m using blend with the warp. Those who have read these narratives for some time will remember that I’m partial to random distribution of the accent yarns I place in the warp. For this series, I made the design decision to combine both random and carefully planned placement of the burgundy yarn. If you look closely at the photos, you’ll see that in the center section these threads are axially symmetrical, while in the outer sections they’re random. It was quite the exercise to work that all out. It was also quite the exercise to get the 10.5-yard warp consisting of three separate and significantly intertwined chains wound onto the back of the loom without breaking threads or tearing my hair. Mission accomplished, and after the tension was adjusted and the whole thing took a nap overnight, the weaving began. Overall progress has been slow, accomplished in fits and starts, but the homestretch is in sight. My original plan was to weave half of the ten with a bright red, and the other half with a bright turquoise. After the first few, I branched out — in the end, there will be two red, three turquoise, one navy, two silver, and two black. Makes it a lot more interesting for me on a long warp like this, and more variety for purchasers to select from. Contrary to my usual boredom toward the end of a series like this, I’ve stayed interested and excited as I go along. Yesterday, I spent some time at the computer before beginning to weave, and designed two additional patterns on this threading, one of which I’ll use. The other will be saved for another time, another application. The combination of these strong colors, which seemed almost harsh to me at the outset, has become pleasing, thanks in great part to the areas of soft grey and warm magenta. The last two will be woven with black and turquoise, respectively. I expect you can see from the photos that — as is my norm — no two pieces are the same. If you think any of them want to hang in your kitchen, or the kitchen of a friend, please let me know in the comments section below. Kathrin gets first dibs; after that, it’s a free-for-all, and you wouldn’t want to miss out! Here on Whidbey Island, though we had some unseasonable foretaste of summer a few weeks ago, the summer season doesn’t truly ramp up till about July 9, according to Professor Cliff Mass of the University of Washington Meteorology Department. The Independence Day holiday is often cool and cloudy, even rainy. This is, after all, the Maritime Northwest, and that pattern greatly pleases many of us old hands. But June is on its way out, temperatures and hours of sunlight are increasing slowly while hours of overcast are diminishing. It’s coming! One of the perennially puzzling seasonal patterns I notice is that often my weaving output slows down even as the season heats up. I’ve never been able to understand why, but it’s quite consistent. May this year was extremely productive; June has been far less so — though truth be told, I had lots of “daily life” matters to catch up on after the intense work last month. Following is a look at part of what I finished up then — a series of three sinuous shimmery scarves which began with a hand-dyed yarn from Blazing Shuttles called “Midnight Treasures”. I added in a solid pearl cotton in a warm coral rose to lighten the overall effect; those threads were distributed randomly through the main textured tencel threads. This first scarf is woven with a deep purple tencel, which accentuates the lighter tones of the warp threads. In this up-close-and-personal shot, you can see the individual threads, with an idea of how the colors interact and how the weft (crosswise) threads dance across the warp threads, creating pattern. The second scarf has a much more complex pattern, this time woven with a greyed teal tencel. It wasn’t till I was finished with this series and had taken them off the loom that I realized that, though they were woven on my traditional (mechanical) loom rather than the big computer-assisted one, I was still working with fancy long-repeat patterns. It’s much more challenging on this loom, but that’s part of the fun for me, and the results are well worth the extra effort. In this detail shot, you can again see the interlacing of the threads, and get an idea of how I balanced the pattern across the width of the scarf. The third scarf gave me an opportunity to go lighter with the weft yarn, in this case a medium lavender tencel called “Hummingbird”. With the very fancy patterning and the softer tones of both warp and weft, this one has a kind of baroque effect. I love it. I don’t know about you, but it always fascinates me to see how the threads intersect and — even under tension while still on the loom — shift the spacings, creating tiny curves among themselves. These scarves are much darker “in the flesh” than they appear in these well-lit photos, with a subtle radiance that plays up the patterns nicely. I named this series “Dark Magic”; they are indeed magical. You can see them in person at my Summer Open Studio Day on July 9, along with a considerable cadre of other recent (and older) work. Or you can order one directly by sending me a message in the comment section below. After a very mild Winter with plenty of rain, we’ve had a Spring that’s been unusually warm (even hot at times) and dry. These conditions have combined to good effect for the garden, which is astonishingly lush and flowery this year. It seemed friendly to share it with you. Lots of photos to follow. Looking in from the entrance gate — Trochodendron, Cotinus ‘Grace’, Parrotia persica, Fagus sylvatica purpurea, and far back on the left the Styrax grove. Paeonia ‘Festiva Maxima’ — an heirloom variety, wonderfully fragrant and fluffy. Thanks for accompanying me on this garden promenade. I hope you’ve enjoyed it as I have. We’ll save the rest for another time. In contrast to the usual long, wet, mostly cloudy Spring weather we have here on Whidbey Island, this year there’s been substantial sunshine and a number of days with more-than-Summer temperatures. And significantly less rain than the norm. My garden is astonishingly lush and gorgeous (maybe a post on that soon! ), so looking out the windows or wandering through one sees a study in greens and burgundies, and experiences the pleasure of seclusion and calm. Inside as well there’s a lot happening, as I steadily move forward with work on both looms, as well as catch up on the hand hemming of a stack of recently-finished designer towels. Today, it’s all about the big loom. It began with two hand-dyed skeins from Blazing Shuttles, a colorway named Green and Gold. One was tencel, the other bamboo; they were not identical in color, texture, or thickness. In March, I received a postcard from the desert Southwest sent by a friend; the similarity of colors to my yarns was striking. Once all my calculations and design processes were completed, I was able to eke out a 12-yard long warp, enough for five scarves. The next photo gives a better idea of how the colors looked when all the threads were measured and ready to go onto the loom. I set up the two yarns across the warp in an A-B-A-B-A arrangement, and used a somewhat complex twill threading which would give me lots of options for patterning. The final one will be woven with a soft terra-cotta tencel (called “adobe”), in an as-yet-undetermined pattern. I already know it’ll be my favorite. The next batch of work on this loom will be another series of designer kitchen towels, in an interesting combination of bright red, turquoise, burgundy and grey. The small loom right now has a series of three scarves in process, about which more next time. They’re luscious! In my last blog post (Vignettes), I was just beginning to weave a new series of designer kitchen towels. Getting started on them had been a long slow process, as I was not inspired by the colors I was going to be working with. There’s a little backstory here to explain that, since most of you probably know that ordinarily I choose the colors for virtually everything I weave. This time was different. Last October, I was the organizer for a weaving retreat held here on Whidbey Island, led by Kathrin Weber (Blazing Shuttles), dyer and weaver extraordinaire. This winter, she initiated a towel swap for the members of the group, and dyed some cotton yarns in colors that were reminiscent of the Pacific Northwest. I selected one colorway called Mount Hood, and another called Stormy Ocean. When I got them, they seemed drab and murky to me; I was uninspired, and did nothing for a long while. One day, in a new shipment of miscellaneous hand-dyed yarns from The Drop Spindle, there was a fat, lustrous pearl cotton in interesting colors, some of which were similar to the ones I’d gotten from Kathrin. Eureka!! there was the accent I needed to bring the whole venture to life. In the photo above, you can see glimmers of it. And in this photo, they’re even more apparent. By this stage — winding the warp onto the loom — I was delighted with how the colors and textures were interacting. The two main yarns were in an A-B-A-B-A distribution across the 22.5-inch width of the warp, and at no point were there similar colors adjacent to one another. There were some very interesting combinations that emerged, and through it all the shiny thicker accent yarn kicked everything up another notch. I loved it all! Two of these were sent off today to Kathrin in North Carolina for the towel exchange, another was sent to its new owner in Florida, and the rest have been purchased by Washingtonians. Needless to say, my early reservations and hesitations were for naught. Ten days ago, on Saturday, I hosted my 2016 Spring Open Studio Day, for visitors to come to my home/studio and observe the weaving process, ask questions, chat with others, view and purchase finished work. Busy day, and lots of fun for all parties though yours truly was truly fatigued at the end of the day. Like I say . . . . had a good time. All the photographs in this post were taken by my friend Danette Sulgrove, so I could have a record of the day but keep my nose to the grindstone. Lots of pictures follow, with minimal explanation. Adjusting the lashing to even the warp tension across the width. It was, as I said, a good day. There’ll be another — the Summer one — on Saturday, July 9. Perhaps you’ll be able to join me. There’s the visible, and then there’s the hidden. Today you get both. The images are all of recent work, photos taken by the inestimable Michael Stadler, who has perfected the art of photographing textiles so that every aspect is crystal clear, including the dimensionality. Interspersed among the pretties is my long-promised narrative on how the basic design and planning proceeds. You can skip that part if you want — there’s basic math involved. For the sake of discussion, let’s say I decide to make a series of three scarves, finished size nine inches by six feet (72 inches), plus fringes at both ends about three inches long. Simple math ahead . . . . First, I need to calculate the length of the warp threads I’ll put on the loom that will give me that result. First, add up the total number of inches required for one scarf — 75 inches (a bit extra is added because when they’re off the loom, washed and ironed, a bit of length is lost) plus two times four, for the fringes. That’s 75 + 8 = 83″ for one scarf. I want three, so it’s 83 X 3 = 249″. Then, for my big computer-assisted loom, I add 27″ to allow for what’s called loom waste. Thus, 249 + 27 = 276″. To convert that into yards (which is the way yarns are measured), divide by 36. So — 276/36 = 7.66667, or 7 2/3 yards. I would probably round that up to 8 yards, so I have a bit extra to play with, maybe make at least one of the scarves a little longer. Next step is to figure out how much yardage I’ll need in total. I’m going to keep it simple here, in contrast to how I rather frequently play with it in real life. In order to end up with a scarf 9″ wide, I’ll need to make the warp about 10″ wide, to allow for what’s called “draw-in”, which is a normal result of the weaving process as the weft (crosswise thread) goes over and under the warp (lengthwise) threads. And, adding another variable, I’ll stipulate that the warp yarn I’m going to use is optimally (in my experience) spaced at 20 threads to the inch. That means I’ll need 200 warp threads to make up the width. So far so good. An important consideration at this point is to be sure I have enough of my chosen yarn to make up the entire warp, so I simply need to multiply the number of threads by the length — 200 X 8 = 1600 yards required. Essential information. By now, I will have designed — or chosen from the several hundred that are stored in my computer — the pattern(s) I want to use for this series. Rarely is it the case that the pattern repeats in the threading come out to a nice neat number like 200, so I’ll need to be flexible and tweak a few things. So, just to add a little difficulty, let’s say I want to use a pattern that has a repeat of 85; two repeats across would be 170 threads, but that would be too narrow. Three repeats would be 255, and that’s too wide. I could use two, and add partial repeats on each edge, or I could use three (a more interesting possibility due to the axial symmetry) and subtract some threads on each side. 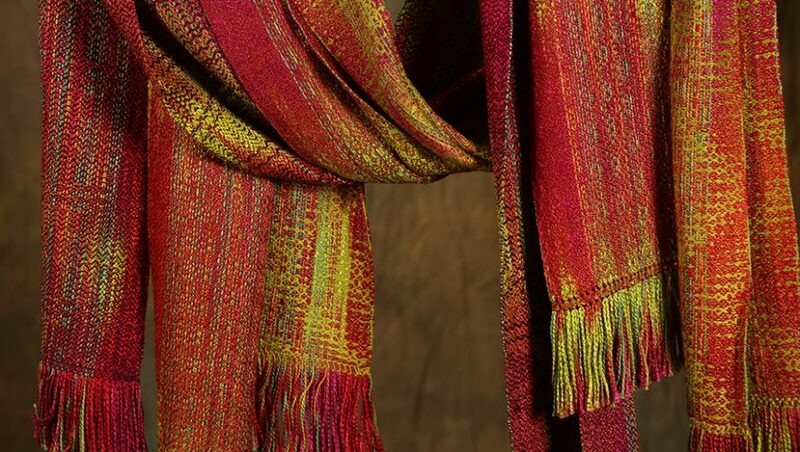 But the most intriguing approach (in my experience) would be to use two full repeats plus 30 threads of the third, and make the design asymmetrical and off-center across the width of the scarves. All three options are good; the third strikes me as potentially the best from a design standpoint. In decisions like the above, there are no “right” or “wrong” choices — all are good, and it becomes a matter of personal preference (or foible) as to which one selects. In the example I’ve been using, the calculations were based on using only one yarn in the warp. I more often use multiple yarns, using one as the “main” or “background” yarn (usually a multi-colored hand-dyed yarn) and one or more secondary yarns as accents, both in terms of color and texture. These turquoise/teal/lavender scarves are an example of this practice. When I’m using more than one yarn for the warp, the total number will need to add up to the number of warp threads I’ve decided upon for this particular series. So, going back to my example above, if I decide to use the main yarn (130 threads), and two additional ones, the secondary ones will need to add up to 70. I’d probably do 45 of one and 25 of the other, and then space them each randomly across the ten inch width so as to make the cloth more interesting and surprising than if they were precisely and equally spaced. It raises the degree of difficulty, but that’s what I most often like to do. These Heart-Throb scarves are an example of a still-different approach, where I kept tweaking the pattern on the computer till I had the elaborate design perfectly symmetrical and balanced, with the number of total warp threads that I had decided upon for the finished width I wanted. Kind of a hybrid approach, which worked out splendidly. After all the number-crunching, the real work begins of preparing the warp to go onto the loom, and everything that follows after that. What I’ve outlined here is only the bare beginning, both with respect to the process and to the time expended. You may have noticed that I skipped a week appearing here. My baby brother (two years younger than me) came for a visit from his mountain stronghold in Truckee, California, and I pretty much gave myself over to spending time with him. We had the best time together in many years. Maybe ever. As children, we fought a lot — the outcome of adults around us unthinkingly pitting us against each other. It took long years, really until less than ten years ago, for us to be friends and to genuinely enjoy and understand each other. That’s not to say we don’t still go head to head sometimes; we do, but now we’re able to step back and ultimately chuckle at our respective intransigence. I love the guy a lot. You’ll notice that some of these photos seem warm in tone, and some quite cool. The warmer ones are more accurate; the cooler ones were taken on cloudy days, so there was no ambient sunlight to warm things up, literally as well as figuratively. You can see the wonderful texture contributed by the oddly-spun rayon secondary yarn; it’s likely to be even more obvious after these are off the loom, washed and ironed. Bonus points if you correctly guess the name of my feline quality control supervisor. She was a bit irritated at being disallowed to do testing on the weaving rather than near it. I was firmly unsympathetic. There’s one more to be woven — the weft will be an ivory tencel, which is likely to accentuate the subtle colors of the warp rather than blending with them. Photos next week, along with the previously-promised explanation of how I go about planning and designing a warp. Be prepared for some mathematical calculations, albeit relatively simple ones! Still Going . . . .
Today’s weather has been quintessentially Spring-like — cloudy, sunny, strong gusty winds, pouring rain. Some of those conditions have been sequential, some simultaneous, and the changes appeared rapidly and at short intervals. My afternoon walk began in a light drizzle, which quickly devolved into a drenching downpour blown almost sideways by the wind. My head and torso stayed dry beneath my bright yellow rain jacket; the rest of me got soaked. I love this weather! All three came off the loom yesterday — Leap Day — and were immediately washed and hung overnight to dry just to the right dampness for ironing. Their completion before month’s end gave me a total of 23 yards woven during February, I believe a new record. My production pace has been quite gratifying. And surprising. The secondary, highly-textured yarn is a shiny rayon with odd long bumpy areas; the weft in this scarf is a pale green tencel. Shimmery finished cloth is pretty much guaranteed. Finally, a sneak preview of the new warp ready to go onto the lovely cherry Baby Wolf loom. This will be another series of three scarves, as yet unnamed. Very shiny hand-dyed rayon and the accent threads of a lustrous pearl cotton. The recent weeks of unusually dense work-time resulting in substantial finished work look like continuing. Completed designs and tantalizing ideas beckon me onward; March is likely to give February a run for her money. For reasons I’m unable to comprehend, my production pace this month has been steadier and faster than maybe any time ever. As of today, it doesn’t feel like it’s letting up, which suits me just fine. I know that at some point I’ll step away for a little bit, or find that I’ve over-committed myself to “outside” activities of various sorts. Such periods always sneak up on me, so for now I’m delighted to ride the wave of excitement and creative intensity. And it’s Spring. In earnest. Which means Winter is effectively over (though we will surely still have lots of rain), which is too bad, as the chilly rainy months are always my most productive. I’m hoping this year to avoid the outdoor distractions for longer than usual. So here’s the proof of last week’s work — it’s a series of three amazingly lustrous scarves in tencel and hand-dyed rayon, titled “Corruscation”. These three, plus the three Heart-Throb scarves and some additional recent work, were photographed today by Michael Stadler in his studio — always a revelation to me. I’m so accustomed to seeing my work up close; when they’re being shot in the studio setting with great lighting at some distance from my eyes, I see them freshly and with an entirely different perspective. I always feel like that view is a kind of final farewell to them, even if they’re still in my possession. You may remember that I now have a second loom in my tool kit. That one too has been hard at work. I may have showed a couple of pictures of it some time ago, but now there’s real progress on the warp I have on it. It’s a hand-dyed tencel from Kathrin Weber of Blazing Shuttles fame, and because this is a mechanical loom (in contrast to the big computer-assisted behemoth), I needed to keep the patterning relatively simple. (You may not think so, but I know otherwise!) This will be a series of three scarves; I’ve titled it “Kilauea”. I’m at the midpoint on this one, and when I go back to it tomorrow, I’m going to reverse the treadling so that the pattern goes in the opposite direction for the second half of the scarf. Thus, when it’s worn, the two ends will mirror each other. A couple of days ago, I was telling a friend about the design process I was working through for a new run of scarves which will be woven on the big loom. It occurred to me that the mathematical and pattern considerations I manipulate to slowly develop a finished design — all done before working with the materials themselves — are a hidden part of what I do, one which I rarely mention much less write about. Next time, you can expect to get an explanation of that part of my process. I anticipate it’ll be somewhat of a struggle to attempt.